Very impressive video! I think noone ever got further than you making a new jj2 game (correct me if I'm wrong). Another important thing is multiplayer (online), do you think you can manage to make that work on the long run? Indeed, after pretty much all the previous projects we have seen got abandoned. This is pretty much the first time I am convinced somebody is developing the real deal on the internet. The number of abandoned projects and frauds of promised things on the internet exceeds my counting. Impressive! While I still have plans to make whole new JJ game, though life gets in the way, my pet feels abandoned, etc., I am impressed. One question: Is this reimplementation of Jazz or Jazz2 engine? //edit: Also, after engine will be done (as in it could run original game flawlessly), perhaps easier to use level editor would be good? 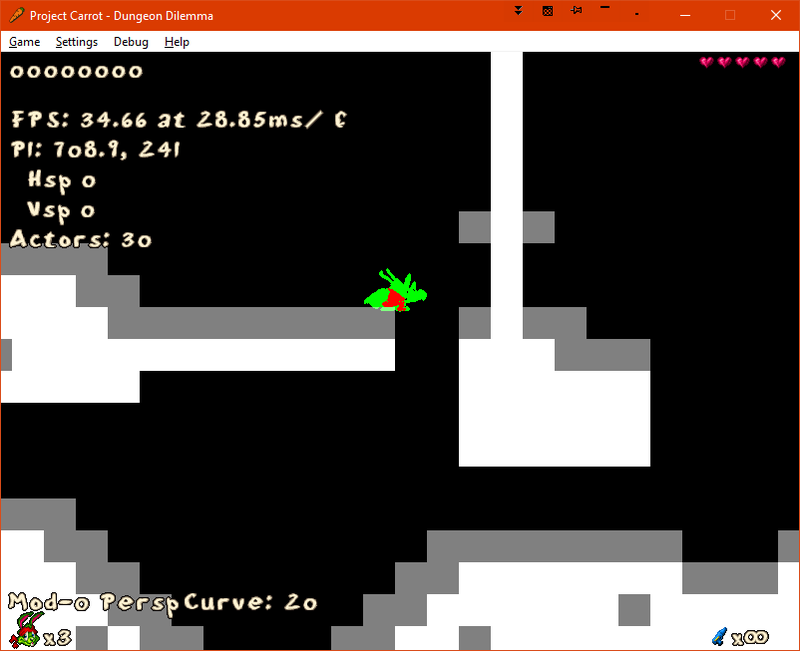 JCS is damn hard - still didn't find out how to set backgrounds (lack of it makes character/enemies/tiles leave ugly "trail") or import custom tilesets. I haven't really kept an eye on other projects to know anything else than that no complete engine should be around, as you said. I've never written a single line of online code, but damn sure I will try to make online play possible as well. If you mean by your question whether I'm using any old code, the answer is no. 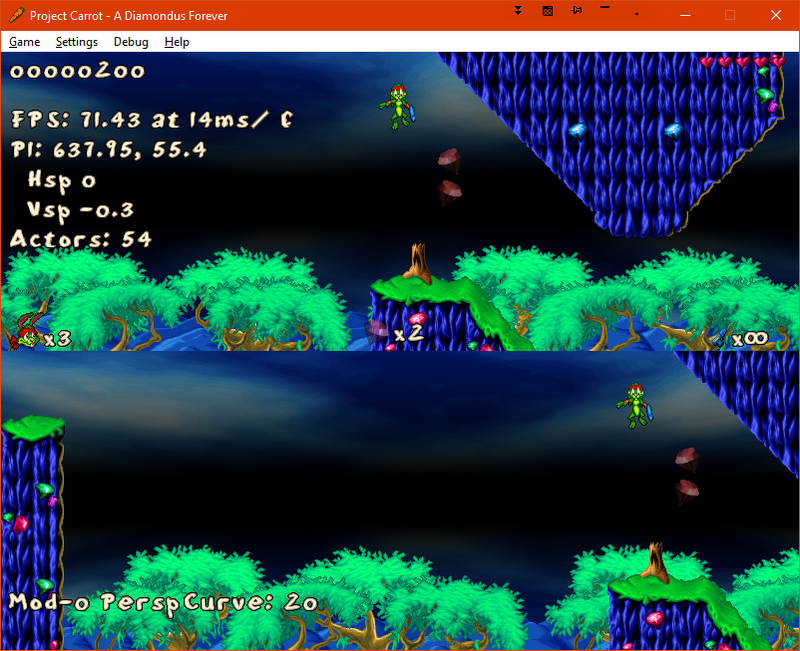 PC is a Jazz 2 engine clone built from ground up without any reverse-engineered code from the original. I will be writing a new level editor once it becomes relevant enough, and I would need to at some point anyway if I ever wanted to expand the event set beyond the current one. So far the only thing even remotely related is this Qt UI file from July; no code using it exists, it's just a quick (heavily JCS-based) design sketch. No, I was asking if you are reimplementing DOS Jazz or Jazz 2. But that solved - from video I see it's Jazz 2. 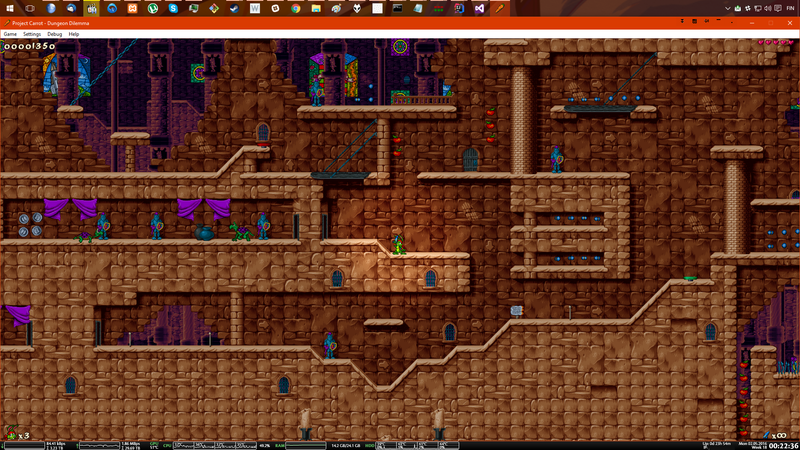 Yeah, but using JCS is still significantly harder, than say RPG Maker's map editor or Tiled. 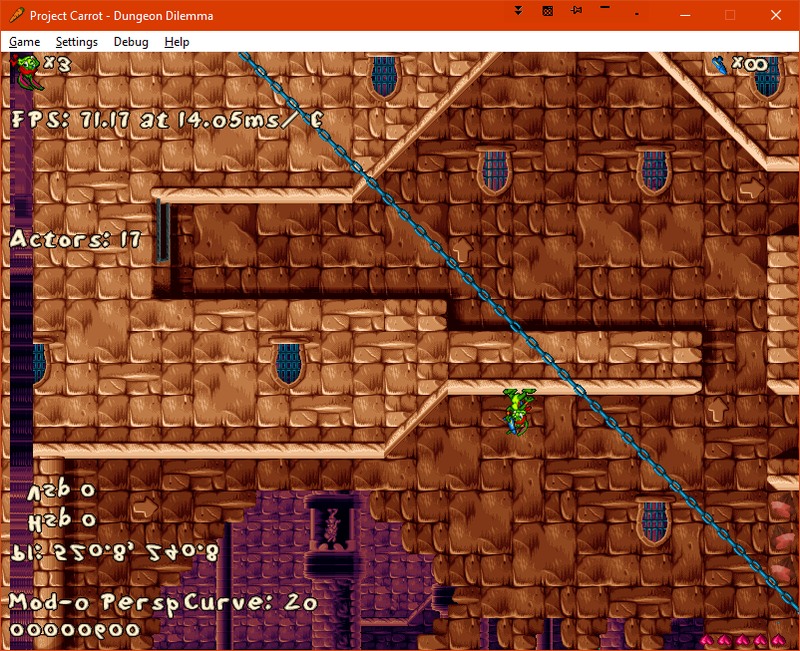 //edit: Also as I am game developer myself, I know that level editor is usually last thing you do in project like this (reimplementation of old game). If this would be completely new game/new engine, level editor would be implemented along with engine to actually test if it works. But since you have both original Jazz levels and user-made ones to test engine with, this can wait until engine can run any thing original Jazz2 could. For JJ1 we already have OpenJazz. Wait, what... you are a game developer yourself, AND you have rather clear ideas of how JCS can be massively improved. Why don't you give it a shot, then? The structure of the J2L and J2T file formats are known. I'd do that... but I simply don't have time. Already has unity and RPG Maker projects on my head (unrelated to Jazz) and I'm not particularly good at writing level editors. Layer positioning feels rather accurate for the first time (for all resolutions); background layers were still all over the place in the second video. Before anyone mentions, yes, I know, textured BG still needs a few tweaks. Awesome. Wrong gems.. But still bridge code! Very impressive work! I'm new here btw, so hello everyone! I've always been a big fan of Jazz2 prompting me to work on my own sidescrolling game engine as well, only to get sidetracked on other things. But I'm tidying it up a bit and will post a thread about it shortly. I'll release the source code so perhaps it will be of some use to projects like this. Welcome to the JCF; fire exits are north, south, and Dennis. Enjoy your stay. On a less sarcastic note, what programming language are you using? C++, I'll give the details in my own thread, but I don't seem to have the privileges to create one at this point(because I'm too new?). Hello and thank you It's always great to see other projects pop up, so if you're planning to improve on yours, good luck Rest assured, you're certainly not the only one who's struggling with sidetracking, I spent a good deal of last year letting my code just sit around while I was playing games and I might be going on a hiatus of a sort due to schoolwork in the near future too. As far as source code goes, I prefer to come up with my own solutions in cases I don't have any means to reference against the original game; that doesn't mean I won't check your code, though. That must be it as you seem to have been able to do that recently. Restricting new threads to established users, either with a minimum post count or a minimum account age, is a rather efficient (but obviously not failproof) method to curb spambots, so I can see why that restriction is in place. The readme in there states the most important things about how to get into diving into the code, but as a recap: you will need MS Visual Studio '13, Qt 5.3.0, SFML 2.1, BASS 2.4 (newer versions should logically work too), and to actually run the game, you will need to contact me via a PM with a proof of ownership of the original (at the very least photos with your name + a boxed copy of JJ2, TSF, HH98 or CC will all do), for which I will provide the currently extracted assets in the format currently required by the code. Also, this certainly doesn't mean I've abandoned the project, but it does mean I've left it untouched for a far too long time. Hey, remember this project? Surprise, not dead yet. And an example of a new view model working – it has no use at the moment, so only one view is used regularly for now, but it is there while it wasn't a month ago. Last edited by Soulweaver; May 1, 2016 at 09:26 AM. Thanks for the update! It's cool to see the places where it looks like you intentionally changed the game behavior... turtles walking up and down hills, and I think I noticed some pickups bouncing off a swinging platform at one point? I'm assuming the tube physics are unfinished, though what I'm not sure is incomplete is the falling physics. Falling seems to go too fast. The falling speed cap should be smaller too. Also launching from springs still looks a bit too fast (no, I didn't use the blooper video as a reference). Nice to see you working back on the project though. Good luck! Yeah, some of it is kinda intentional, in the way that when I've tried to implement a feature, it has accidentally ended up with a neat side effect that I haven't tried to (or maybe succeeded to in some cases) remove. I can't remember what my original vision was, but at the moment my strong opinion is that even though I try to be as compatible with the original engine as possible, in the end I'm already at a point that a complete clone would be difficult without revamping most of the inner structures. Their limitations would especially be detrimental if/when it is ever going to go into the territory where completely new features are added in. 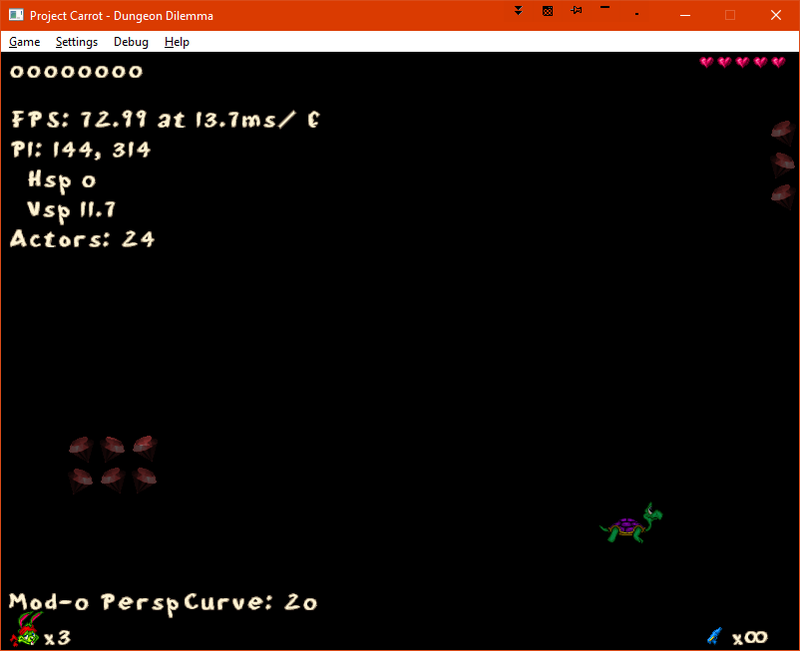 I actually listed enemies walking up and down the hills as a bug in the OP (which I should clean up soon), but I might just as well keep it, at least as a default behaviour. Your observation with the coins being bounced by the platforms was correct as well: the platforms have standard collision checking with all actors. Only players can be carried by them at the moment, though – expanding that to other stuff could be something interesting to look into later. Thanks! I'm assuming you have better knowledge of the physics than I do, so would you mind to elaborate on how tubes seem incomplete? Factors like speeds are fairly easy to change and they've seemed good enough, so I've kept them as is for now and focused elsewhere instead, but if they seem to be off significantly, I might look into them in the future. For the springs, you are probably correct – changing how it works would require some non-trivial changes at the moment, though. Disclaimer that the above reply to Violet applies to this as well though: being a 100% clone is a very low priority if at all if it comes with a high-cost compromise somewhere else. Last edited by Soulweaver; May 1, 2016 at 11:51 AM. Still looks nicely similar to the original, and it's encouraging to see some progress. 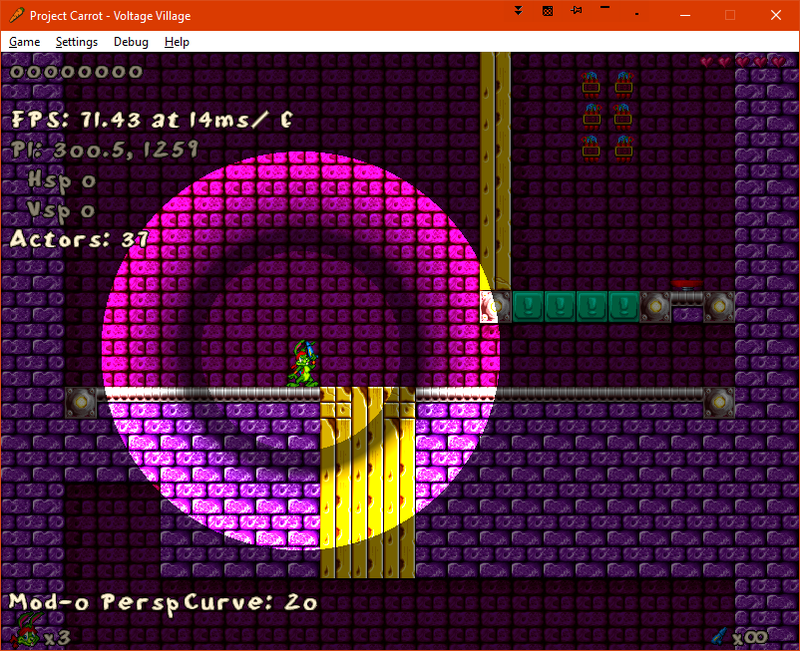 I also had the feeling that the physics are "off" in some ways but at some point I suppose the law of diminishing returns kicks in and it's not really worth the effort of getting it pixel perfect. And things like enemies walking up slopes actually allow for more exciting gameplay than vanilla JJ2, so there's that too. Could you tell a bit more about the end goal of this project? It would of course be nice to have a JJ2-compatible engine that is easier to tweak, but given the existence of JJ2+ (which you are surely aware of) it will probably see little use for playing existing levels. Would it be easy for people to use it as a general purpose 2D engine, for example? Yeah, I'm aware of JJ2+ (though I have to admit I haven't come around to actually try it out yet). Can't tell if I had heard of it in early 2013 when I first started the project, though. The point about a general purpose engine is one that I hadn't considered but that seems quite obvious in hindsight. At the moment it is already very easy to replace the graphics and sounds with something else – PC is not tied to any of the JJ2 formats after all but uses its own for everything – and with some minor changes you could already add gameplay elements that transform JJ2 into a new game altogether. TL;DR: Goal is a mostly compatible open-source engine with main targets as local game modes, extensibility – especially in the future – and the honing of own programming skills. Before that long break, I had set the first test release to be when the Shareware Demo episode is fully playable, with the exception of a few specific events. That's what I'm still planning to go for, but we'll see if it seems useful enough for me to release something before that. Assuming I can keep the current pace, I'm quite sure getting it there would still be at least a few months away, though. I'm tracking the list of events left to do for that release in this issue I added yesterday (I had had it in a random text file before that, so it isn't really new). This milestone also collects some (not all) of the bugs and missing features that I'd like to also have fixed/added in at that point. That is eventually the intention, yes, but not a priority for quite some time now. And thanks! Wow!Looks promissing.I guess it's gonna be unofficial refreshed Jazz Jackrabbit 2 Open Source Edition.Hey!Will Project Carrot support Android devices and rest unfficial ports like OpenJazz? All of the libraries I'm currently using do support Android (and iOS), so there's a theoretical possibility. That said, I have zero experience on mobile development, so I'm making no promises at all, and of course, even if it happened, it isn't really high up on the priority list. 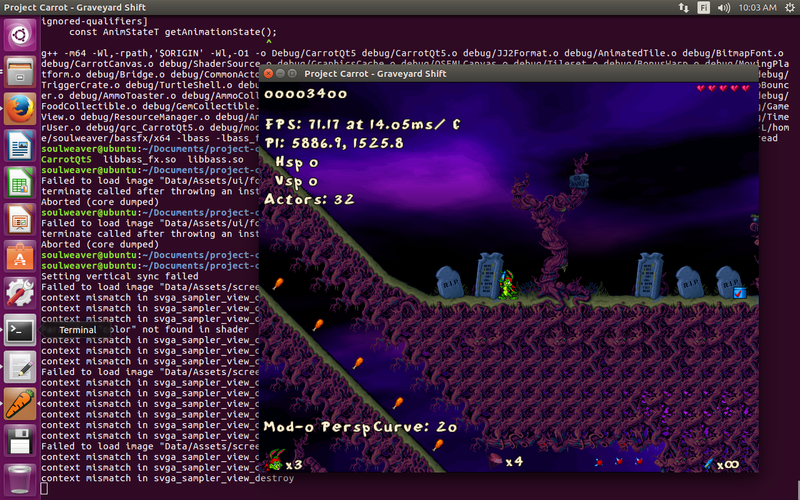 Making some progress with pixel-perfect collision tonight. Last edited by Soulweaver; May 5, 2016 at 11:22 AM. Really cool. Is there's a GitHub of the thing? I mean, with more developers around it would proceed faster. Soulweaver you can count on Alister Thomson.Guy who made a open source port of jazz jackrabbit 1. I do believe you're talking about this? Thanks. Will look through it to see if I can help with either optimizations or new code. 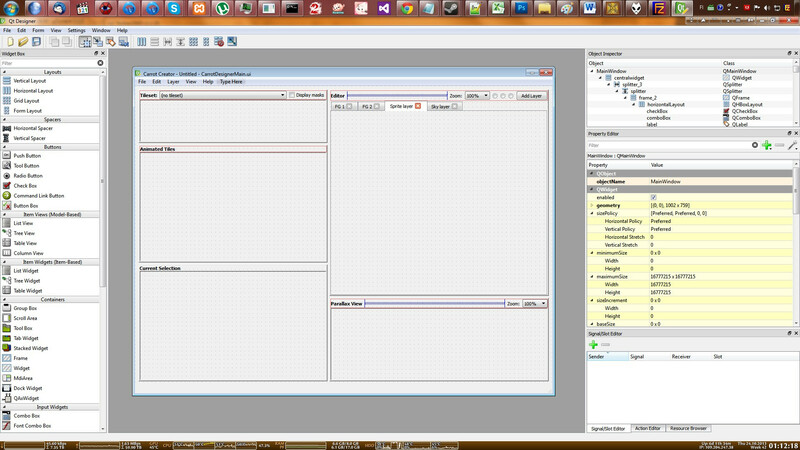 Yeah, the source code is available and visible there. I don't outright refuse help, but it is discouraged at least for now: there's still still some refactoring ahead which may mix up things, and I am not really tracking too accurately what I am working with at the moment, so it cannot be guaranteed what you'd like to work on actually needs work currently. openjazz was game(still in actual updates from 2012 to 2015) engine clone for jazz jackrabbit 1,jj2+and project carrotus are game engine clones for jazz jackrabbit 2 as for jazz jackrabbit 3 unofficial patches are over so i guess there's no need for game engines clones for jj3d from unreal engine 1 and jazz jackrabbit advance game engine clone-it's crap from gameboy advance not the best like jazz jackrabbit classics.Unless I found UShock tool for Unreal Engine aka map viewer,but it makes no sense if someone like me wants to make jazz jackrabbit 3 again. Sounds cool! It'll be great to have JJ2 playable on all three major OSes. i'm still wondering why's no tcrf.net articles about canceled jazz jackrabbit 2 sequel jj3.Anyways jj2 fangame engine clone is looking great,curious.Now stijn knows my criptic life,but why he's covering/hiding another jazz jackrabbit fangames.No matter what he's planning to ban me permamently. 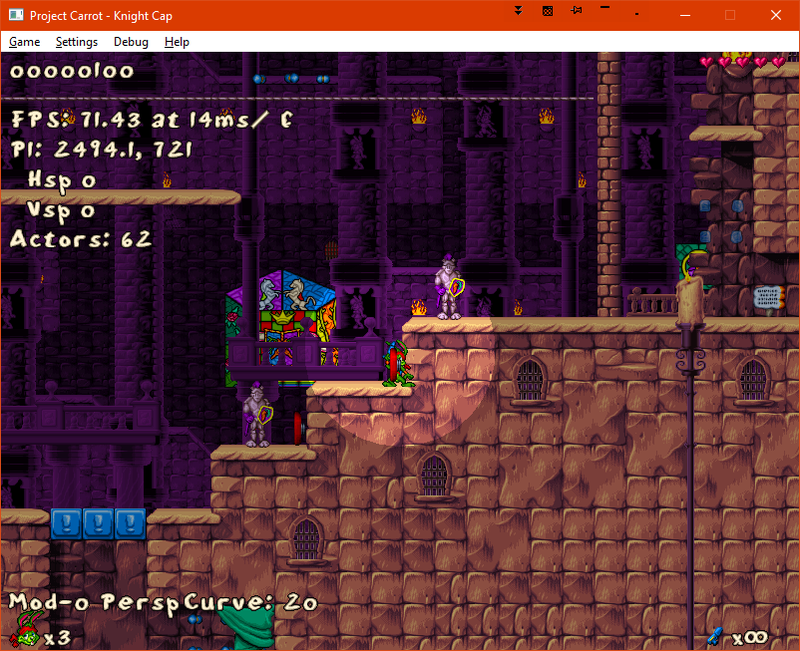 A great thing about a project like this is the possibility of widescreen support and better antialiasing for the low res graphics... unless pixels is what you're going for. In any case, a modern game. Good work! I really hope this could become the future of JJ2!